It's finally here! Now you need to get ready and get out on the marathon course. We'll start with your final prep, then go on to on-course tips for pacing, water, and restroom stops, and making it to the finish line. Study the route map and know where the aid stations, water stations, and restrooms are along the course. Study the race instructions to be sure you know exactly where the start is, exactly what time to line up and start, taking time zones into account. Get familiar with terms and strategies with our race day guide to the starting line. Check the weather forecast and modify your gear accordingly. Get tips for walking races in the rain. Make sure your marathon day clothing and gear is clean and dry. Set out all of your gear and make sure it is all ready. Pack extra safety pins for pinning on your race number or pinning your clothes together. Eat moderate carbohydrate meals, but don't eat anything new. Cut back on fiber and roughage. Know your way to the start point, parking or transit arrangements, and plan your timetable. If you are going with friends, finalize your plans and reaffirm them. If you are meeting somewhere to go together, be sure to be exact about where and when. Go to bed close to your usual time, aiming for eight hours of sleep. Wake up with enough time to prepare. Drink a large glass of water (16 oz. or more) two hours before start time, then do not drink again until after the marathon begins. This gives your body time enough to get rid of the extra water without having to make an early restroom stop. Ensure the timing chip and bib number are properly attached. If the chip goes on your shoe, carefully read the instructions. Check your gear. Throw in any last minute items dictated by the weather, such as gloves. Get to the start point with plenty of time to get oriented and get in line for the restrooms for one last stop. Make sure you are in the right group and at the right start point, especially if they have a special time or place for walkers. The marathon is an endurance event. You are pushing your body to its limits of endurance and you need to conserve energy throughout the event to make it across the finish line with a big smile for the camera. Through your training, you should have a good idea of what your finish time will be and what pace you need to set. Steady pace: Aim to set the same minutes per mile throughout the marathon. This means holding back at the start, when you have the most energy to burn, and saving it for the end. Reverse splits: Start out at a slow pace and increase your pace in the middle of the race, completing the miles at the end of the race faster than at the beginning. This is extremely difficult to do for a marathon distance. Slow, fast, sag: This is the pattern most people will achieve. Start out at a slow and steady pace to warm up for the first six miles. Increase your pace in the middle of the race. Plan for the sag after mile 21, which happens to most people. Practice your pacing during your longer practice walks. Time yourself and get to know what your steady pace feels like, how you are breathing, how it feels. It is easy to get caught up in the excitement at the beginning of the race as the pack breaks up and you can pass others. But hold to your strategy. You may want to invest in paced walking music to train yourself to a certain pace or make up a race mix of songs that are at the right tempo. Some marathons don't allow headphones on the course, but by using the music in practice you can train yourself and remember the rhythm even if you can't listen during the race. Watch your walking form throughout the race. Check yourself. Are you leaning too far forward or back? Overstriding? Head down or thrust forward? 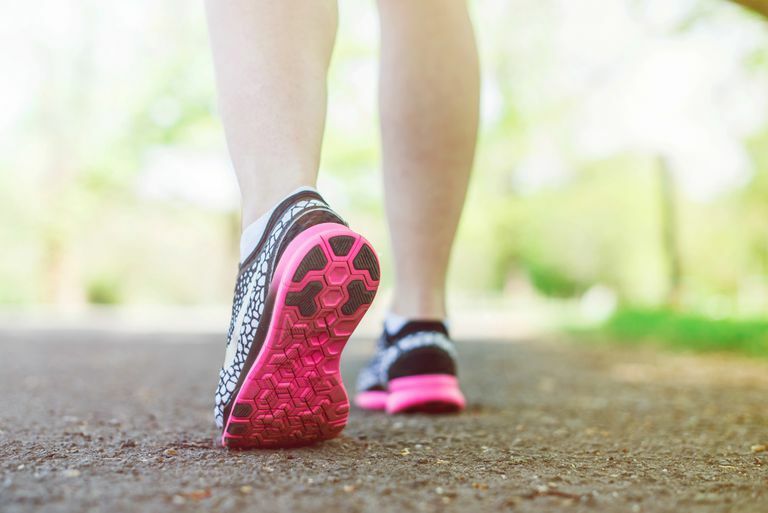 As you tire, some of your bad old walking habits may creep back into your walking form. Watch for them and correct them. It may seem like a delicate subject now, but there is nothing delicate about it during the marathon. Prepare for using portable toilets before and during the marathon, as they are what is commonly available at larger races. Usually, these are fresh, clean rental units, not the stale and smelly ones you may have been using in parks on your training walks. Study the pre-race materials to see where the toilets are provided along the course and at the start and finish line. Use the Starting Line Toilets: The lines might seem long, but you don't lose any official race time before you cross the starting line of a chip-timed race, even if you start after the starting gun. Get in line. As the starting gun approaches, many racers will leave the line. Take your time, do your business, then think about crossing the starting line. If you are racing with a partner, force them to do the same. Nothing New on Race Day: This mantra especially applies to what you eat and drink on the course. Don't chug down unfamiliar energy gels or sports drinks they offer on the course. Research which hydration drinks and snacks will be offered at the aid stations and use those during your training. See if they give you stomach cramps before the real race. Porta-John Etiquette: Stay aware when you are near the front of the line so you don't waste time or distress those behind you. Knock before opening the door even if it appears to be empty, as racers often forget to lock the door. Remember to lock the door yourself. Don't dispose of trash inside the john other than toilet paper. Take care with your gear so you don't lose your iPod or cell phone down into the tank. Racers Do It Anywhere: During the marathon, many racers have a reduced need for personal privacy. Every marathon has its areas where people (yes, women as well as men) line up and simply urinate more or less in the open. At my first marathon, a group of women formed a circle in the park next to the starting line, dropped trou and urinated. Be a good neighbor, don't use anybody's yard or garden for a toilet. Even more shocking: true competitors often don't even stop, they simply wet themselves without breaking stride. I don't recommend this, but if an accident happens, at least you could claim to be a true competitor. Reduce the amount of fiber and roughage in your diet the three days preceding the marathon, as well as irritants such as cinnamon or hot spices. No beans, no cabbage, no broccoli, no salsa. Bagels and bananas are good carbohydrates and also seem to take a long time to pass through the gut. Avoid dairy products in the day before the race if you suspect or know you are lactose-intolerant. If you discover on your long or fast walks that you suffer from "runner's trots," take Imodium or other anti-diarrhea medication before the marathon. Pack some toilet paper and wipes in your hip pack. The porta-johns often run out. You may also want to carry a small bottle of hand sanitizer. Cut back on caffeine on the day of the marathon, it is both a stool softener and a diuretic. Drink a large glass of water 2 hours before the start, then drink nothing until the first water stop on the course. Get in line in time to make a final restroom stop before the start of the walk. The last five miles of the marathon are the hardest. Your body is ready to stop. You are going longer than your longest practice walk. You may have developed blisters, or found new aches and pains in your legs, hips, back, neck. All you can focus on is that final distance. Here it comes, you are coming down the stretch, the announcer is calling out names and numbers, you pass under the finish line and you have done it. You get your medal and whatever other goodies they shower you with. Proud friends snap your picture. First, your body is going to cool down dramatically, even on a hot day. Many marathons give out a space blanket at the finish. Use it, at least for the first 15 minutes. If you begin to shiver uncontrollably or feel faint, signal for medical help from the race officials. Drink up — You will need to replenish your water and fluids. Eat — If food is offered at the finish, try to eat a little something. Keep moving for the first 5-10 minutes, walking around slowly. After 10 minutes, get off your feet and elevate your legs if possible. Do self-massage or have a friend help you, massaging gently in long strokes towards your heart. Hose off your legs with cold water or massage them with an ice bag to bring down swelling. Do not stretch — Your muscles will be very tight and have suffered damage simply from the distance. Stretching them when they are in this condition may cause injury. Drink, drink, drink. Juices or non-diet soft drinks will replace water as well as carbohydrate. Avoid alcohol and caffeine. Get some real food an hour after the marathon, as just taking in sugars can lead to nausea. Bananas, yogurt, and crackers are good for a start. How Far Is a Marathon in Miles and Kilometers?